Though new food fads are created daily in the restaurant business, it is often the old favorite dishes and drinks that are top sellers. The same is true is in restaurant marketing. Public relations – announcing your story before everyone else does it for you – has been around for years. Some might say that public relations and its main dish, the press release, are old news in today’s digital age. Yet PR is still the building block for restaurant success and a key step to customer credibility. For owners with an eye on the bottom line, restaurant PR can produce results. It can get people talking about your restaurant, your new space or your new menu. Wellons Communications has had success with restaurants across the Sunshine State, launching new restaurants and keeping existing brands in the public eye – no matter where the customer gets their news. 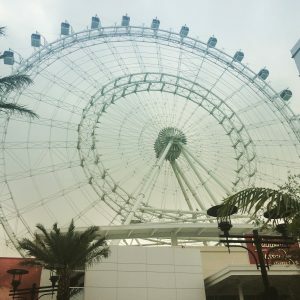 This month kicks off the celebration for Orlando I-Drive 360, a new entertainment complex with the Orlando Eye, attractions and host of wonderful shopping and dining options. Our agency is proud to play a part in the promotion of this new mecca for tourists. We were honored to open Tin Roof, a restaurant and live music venue, as well as Cowgirls Rockbar. We also opened and partied with McFadden’s Restaurant and Saloon in the neighboring complex Vue at 360. For each of the openings we used public relations to help find qualified staff, educate food media on new signature dishes and create credible media buzz that brings people in the door. At Wellons Communications, we don’t make the food – but we do make it sizzle.